This manual describes the rules of choosing a campfire site, the technique for starting the bonfire and preparation of fuel in field conditions. The manual describes different types of bonfires used for different purposes. The activity is arranged in a form of a game with elements of competition. This activity begins a series of studies devoted to the organization of students’ research in winter. However, as with lessons from other seasons, the series begins not with research itself, but with practical activities. In this case the activities are aimed at fire- making skills and camp construction in field conditions. It is possible that the skills students acquire in the course of the given lesson will prove useful in following activities, i.e. when organizing ecological field studies in the course of a camping trip and expedition that lasts several days. Because the lesson is not specifically oriented to scientific research, we recommend it as a single day activity in the form of a game with elements of competition. During the first stage of the activity, the teacher explains and demonstrates the guidelines for choosing a temporary site for a fire, the technique of setting the fire, methods of preparing fuel and various types of fires. The second stage of the activity is the competition to start the fire. For this purpose, it is best to take students to the forest where there is fuel and it is possible to make a camp fire at the end of the day and to seat together after the competition. At the field site we recommend that the group be divided into pairs. 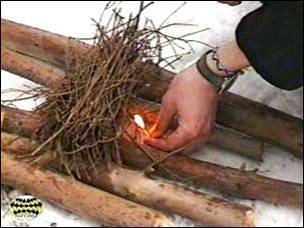 Each pair is given five matches and the task to start the fire as quickly as possible. Each group must choose a site for their fire, collect fuel and start the fire so that it will not die out. It must be done quickly and with use of the least number of matches. If a group uses all their matches the teacher may gives them another five, and so on until the fire starts. After the competition all fires must be safely extinguished. In this field activity a class report is appropriate. The report may include the results of the competition (amount of time and number of matches for each group of students), 2-3 pictures of students during the most important or funny episodes of the day and pictures of different types of fires made by students. Hence, the present manual is not a manual according to its purpose, but it relates some rules of organization for camping and expedition life. Unlike all the other manuals for the educational activities of the given series it has been completely adopted from master campers and enthusiastic hikers (G.Ya. Ryzhavsky, 1995). The author is an experienced traveler, a master of sports in this field and a man of humor. We consider this text, which he has written about fires, to almost completely satisfy our ideas of the fire building aspects of hiking trips or field research, so we inserted it into the given manual almost without changes. If you announced a contest of the best camping emblem, undoubtedly, a fire would be that emblem. In one recording, where "all campers' wisdom" is collected, it is explained that “ . . . a bonfire is a contrivance designed for campers' warming, cooking and drying of wet clothes.” Even a staunch pragmatist would not feel any interest in hiking after having read such a definition. It is possible to cook, get warm and dry wet clothes at home! Therefore, a bonfire is more than just a flame. It is the center of a camp (bivouac). The bonfire is kitchen, dining room and sitting room. It means dry clothes and hot water, protection from horseflies and other bloodsuckers; it is a place of communication, and it is heat and comfort. Moreover, the bonfire is an accumulator of cheerfulness, energy and activities. No trips or hiking tours in forested areas are without a fire. The bonfire is a reliable friend of the camper. One is to treat it skillfully and with respect. If it is treated carelessly, it can become a cruel thief. Fires can be dangerous! So, a fire is an emblem and a symbol. And a symbol should be held in high respect! What does any bonfire begin with? It begins with a site. If the camping site is narrow and uncomfortable then the bonfire site is given the best place in the camp as the beloved but fretful child. The bonfire should be placed not high and not low, not far away and not close. It should light up all the tents if possible and its smoke should disperse mosquitoes throughout the whole camping site, and the fire itself should produce enough heat for all the members of the group plus three cauldrons or buckets. However, it can be dangerous if sparks from the fire do not have enough time to “die out in the air” and reach a tent. It is not good if the smoke chokes not only mosquitoes but humans as well.